We’ve compiled a list of the remaining features that need to be completed for this release, broken it down into a series of tasks and estimated how long each task will take. We’re fairly confident that the Early Access version will be ready by the end of October. In this update, I’ll look at what we’ve accomplished recently and the tasks still to complete before we can hit Early Access. Galaxy Size: Tiny (20 stars) up to Huge (300 stars). There’s no technical limit to how many stars we have, but 300 seems a sensible upper limit for gameplay reasons. Galaxy Age: Primordial, Young, New, Average, Old, or Ancient. Younger galaxies have larger nebulae, more stellar gas, and fewer habitable planets and ancient ruins. Type: Elliptical, Globular Cluster, Open Cluster, or Stellar Nursery. Spiral galaxies are a little trickier and will be added later. Stellar Gas: Nitrogen (Blue), Oxygen (Green), Hydrogen (Red), Helium (Orange), Carbon Dioxide (Purple), Random, or Off. 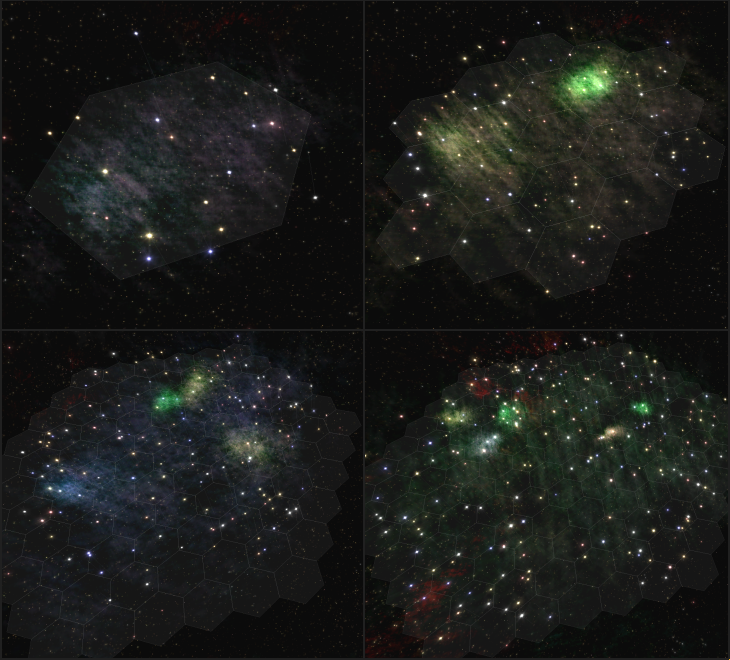 Below are a few example galaxies generated with the new system, from a tiny galaxy in the top left to a huge one in the bottom right. The nebula code is now more efficient and we’ve added the ability to disable the stellar gas to help with the frame rate on older computers for now, and we plan to add further optimisations and low graphics options in the future. The colour of the interstellar gas isn’t just cosmetic, it also affects the colour of the first nebula generated. If you pick Oxygen, for example, then you’ll always generate a map with at least one Oxygen nebula. Stars that generate inside nebulae now have special properties applied to them that affect their planet generation. Planets inside Nitrogen nebulae will be more likely to have an atmosphere (Terran, Swamp, Ocean, Tundra or Desert class), those inside an Oxygen nebula will be more likely to be Terran and will roll with more organics (fertile soil spots and more coal deposits), and planets inside a Hydrogen nebula will be more likely to be Molten and Barren but rich in ore. We’ll add effects to Helium and Carbon Dioxide nebulae at a later stage, perhaps making them attract more space monsters or temporal rifts. Naturally, each nebula will also have various effects on Fleet Combat in the system, ship movement etc. One of the big points of feedback we’ve taken on board from the beta versions is that the user interface could use some work. We want to keep the UI as simple and intuitive as possible, but that’s a big challenge in a 4X game as there’s a lot of information to convey to players. To avoid information overload, we’ve extracted a lot of information out of the main UI and put it into new information-dense mouseover tooltips. Only the most vital information is now drawn directly on the UI or game buttons, with detailed stats and other useful information now being moved to the tooltips. If we want to have AI enemies play the game effectively, we have to teach them how to explore and colonise planets effectively. A lot of my recent work has gone into that part of the game, and we now have a working AI in place that evaluates the needs of a planet and expands accordingly. It can build farms and power plants to cover each city’s needs, and also ore refineries and research excavations as appropriate. 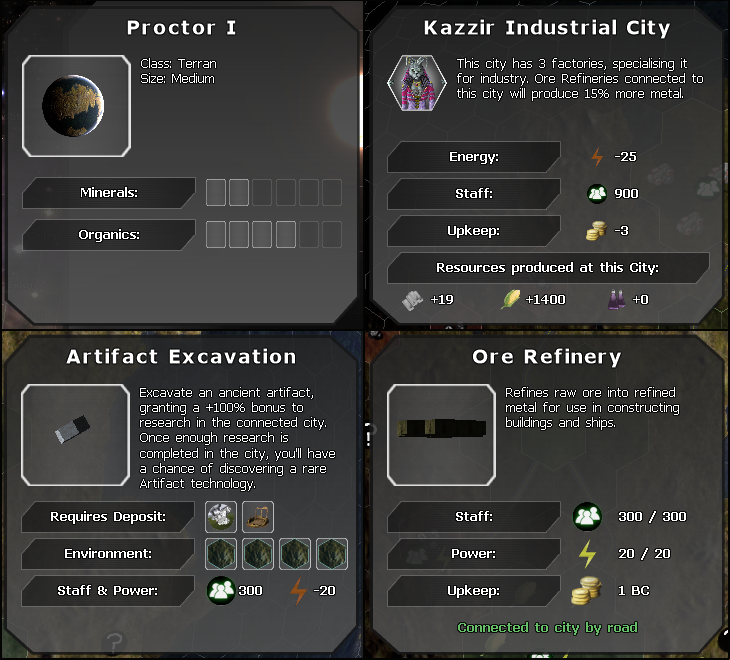 It also picks what type of specialisation a city should have based on the planet’s available resources, so it’ll build lots of Research cities on a planet with plenty of Ancient Ruins and Factory cities on planets with plenty of Ore deposits. Blueprint Creator: This tool automatically generates default blueprints in useful categories like Research, Industry, Farm, Residential (Tax) and Defense, and will automatically update them if you get new technology. We imagine that many players will choose to use the default blueprints in order reduce planet micromanagement in exchange for that extra convenience. AI Governor: We could let players optionally put an AI Governor in control of a planet and simply select a planetary specialisation (research, industry, residential, defense etc). The governor would explore and colonise the planet for you, eliminating 100% of planet micromanagement for those who want to play a more strategic game. Population is now a global stat rather than each city having its own population. This makes the game a lot more sensible on the planetary level, as you don’t have to worry about each city having enough staff for its own infrastructure. Depleted deposits don’t disappear completely. Ore deposits now produce 2 metal/turn or 1/turn when depleted, and Coal plants simply shut down when the deposit is depleted rather than self-destructing. The Solar, Wind, Geothermal and Wave power plants have now been turned into infrastructures that are placed on the planet’s surface instead of inside cities. Miniature versions of each can also be built inside cities to let you tweak power generation. When you find a deposit of something you haven’t researched the technology to use yet (e.g. crashed ships or uranium), it now shows up as a “?” on the map. Once you have the Sealed Tube technology, roads can automatically go under water and tubes are automatically placed on top of any road type. Galaxy AI: We’ve started work on the galaxy level AI, which will manage the AI empires, colonising new planets, selecting technologies to research and building fleets of ships. This needs to be finished and thoroughly tested before early access. Adjustable Tax: We’ve built the tax system and made tax decrease morale across your empire, lowering metal/research output. Now we need to make a UI to let you adjust the tax rate and see the consequences to empire morale. We also need to add some special events that can be triggered by low morale, such as riots, bombings and thefts. If morale is low enough on a planet, the planet’s loyalty rating will start to drop and the planet may eventually defect from your empire. Diplomacy AI: We’ve built a diplomacy AI that can evaluate your offers and decide whether to accept or reject them. Now we need the AI races need to be able to contact you with their own trade deals. The AI also needs to remember any past dealings their empire has had with you and use that in their decision-making. Freighters: The ability to build freighters to shuttle metal, food and energy from one planet to another or to offer it in diplomatic deals. Recurring trade routes will be added at a later date. Fleet Combat: Ground-based weapon buildings need to be added to combat in defense of a planet and need to be able to fire using the planet’s energy reserves. Bombing Phase: After defeating any ships defending a planet, you’ll be able to open the planet and drop bombs in strategic locations. Take out the enemy’s farms and power plants, destroy roads, or bomb the cities themselves. Bombs will leave craters on the surface, cities will be able to have shields to defend against bombs, and we’ll need a bombing AI to let the AI bomb your planets or allow you to hit an Auto-Bomb button. Dropping troops to capture a city will not be part of this version but will be added at a later date. Radial Menus: Adding right-click menus to buildings, infrastructure, planets and ships with options like Salvage/Demolish, Move, and Info. This will help clean up parts of the UI that currently aren’t very intuitive. Planetary Sensor: Make this ship module actually scan planets from orbit slowly over time, exploring them just like a planetary scout would so you can find a nice planet before colonising one. Command Points: Just like in MOO2, the number and size of ships you can build will be limited by a Command Point system, with harsh penalties for going over the limit. Larger empires will end up with larger navies. The sandbox mode will be fully playable once these features are implemented, and we can then concentrate on rolling out other major features like spying, the finished 3D ship designer, and singleplayer story missions. Tagged 4x, colonisation, development, galaxy, game, game design, game development, game-design, gaming, graphics, indie, indie game dev, indie game development, map, master-of-orion, moo2, planet, planets, predestination, sci-fi, screenshot, space.